Join Taylor Distributors of Indiana for top of the line equipment demos all day long! We will be conducting abbreviated Naboo Challenges every hour, on the hour to showcase the versatility of Lainox brand combi-ovens. Also in the lineup for demos on demand is the Taylor two-sided grill. Join us as we cook live to show the reduction in cooking time of up to 75% while preserving moisture in the final product. Automating cooking cycles that usually require manual intervention has never been easier. The MagnaBlend line from Taylor will be available for demos on demand. We’ll be ready to spin up frozen concoctions ranging from milkshakes, premium frozen concentrates as well as less expensive bar concentrates to display the adaptability of these awesome blender units. Flavor Burst units will be on display for you to learn how you can serve up to 9 flavors of soft serve from one machine. Have you been interested in adding a premium ice cream option to your business? We’ll have you covered with a reliable Taylor batch freezer perfect for gelatos and sorbet. One of our newest additions to the Taylor Indiana lineup is the Egro One Touch. This incredible coffee machine will eliminate the headaches that come with traditional systems. The Egro One Touch will automate the process of making delicious and profitable coffee drinks. 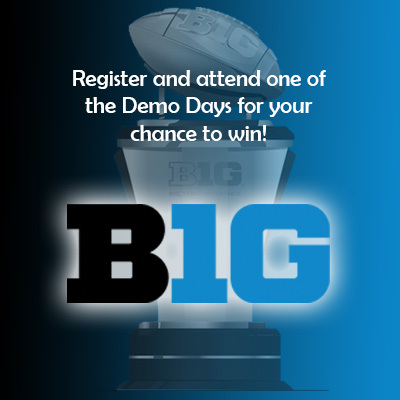 Register and attend either day of the Fall Demo Days for your chance to win (4) tickets to the Big Ten Football Championship on Dec. 1st at Lucas Oil Stadium. Drawing will occur at the end of the show on Friday. Winner will not need to be present.